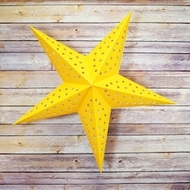 Paper Star Lanterns - Star Lamps Now on Sale! Paper Star Lanterns, or star lamps are illuminated from within by a glowing LED or other light bulb (up to 40 Watts) and can be hung from ceiling or high up on a wall. 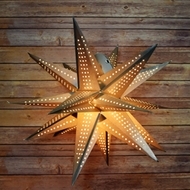 Some of our star lanterns have cut-outs which projects patterns on walls to really create a unique atmosphere. 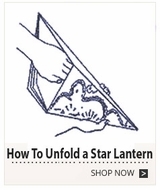 Most stars have a hollow center which allows you to add a light bulb and make your star lantern glow. All stars are 3 dimensional. 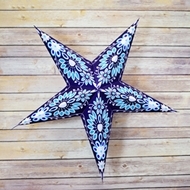 Most our star lanterns are handmade and dyed in India. 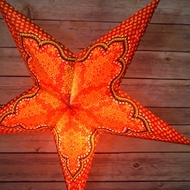 Star lanterns are widely used throughout the year, but they are extremely popular during Christmas time. During Christmas, decorators and event planners use these lights to decorate Weddings receptions, parties, festivals, shopping centers, and much more. Our star lights can be used with our different lighting options, such as cord kits for star lanterns, C7 and C9 globe lights, and commercial string lights for outdoor use.